Brett Stark (21) gets set to launch up a three-pointer during Tuesday night’s 21-point DS victory at Norwood. Tim Cofield (33) fights off a defender and moves the ball around the perimeter. 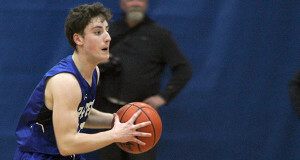 The Dover-Sherborn Regional boys basketball team traveled to Norwood on Tuesday night for their first-ever TVL matchup with the Mustangs. Coming off a tough 49-28 loss at rival Medway on Friday that ended a previous four-game win streak, the Raiders were looking to get back on track against their new TVL counterparts. 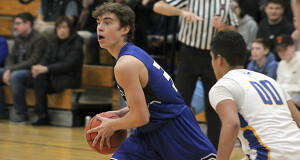 Behind a game-high 17 points from senior captain and forward Brett Stark, the Raiders (7-2, 3-2) got out to an incredibly fast start and cruised to a 21-point victory. DS began the game on a ridiculous 25-2 run, at one point outscoring Norwood 24-0 after falling behind 2-1 in the opening minute. The run featured three-pointers from junior guard Kirby Ryan (10 points) and junior guard Evan Skeary (nine points), as well as a three-point play by Stark to begin the second quarter and push the lead to 23 points. Norwood cut into the deficit with a quick 9-0 run to make it 25-11, but back-to-back layups off of transition by Stark pushed the DS lead back to 18 points at 29-11 at halftime. Stark picked up right where he left off before halftime to begin the third quarter, forcing a steal at mid-court before banking home a layup and-one for a three-point play less than a minute in to make it a 32-13 game. A layup by senior captain and forward John Muckstadt made it 37-20, but a 7-0 run by Norwood to end the quarter gave the Mustangs new life. Norwood trailed 37-27 at the end of three. With their opposition holding the momentum, it was time for DS to deliver a statement, and that’s exactly what the Raiders did to begin the fourth quarter. Senior forward Alex Waugh banked home a two-point fade to push the lead to 39-27, followed by a lay-up from Ryan and a dagger three-pointer by junior forward Jacob Brown (five points) to make it a 44-27 game and force Norwood to a timeout. Kirby Ryan (pictured) gets set to dish a bounce pass. The stoppage did nothing to slow down the Raiders on offense, as DS continued to hammer away and quickly built their lead back up to as many as 22 points at 54-32. The Raiders killed the remainder of the clock, and prevailed with the convincing 56-35 victory.